There’s a wonderful book by Dr Seuss that all parents should read to their children. It’s called Oh, the Places you’ll Go, written for young people as they set off on life’s exciting journey towards success (“98 and ¾ per cent guaranteed”!). But it’s not all breathlessly gung-ho. 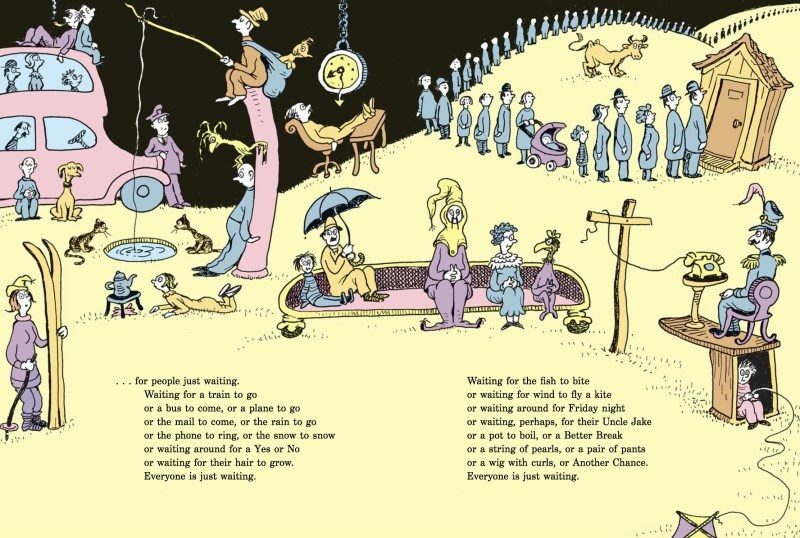 The book acknowledges that there are amazing possibilities out there, but sometimes we find ourselves in the Waiting Place, where people are “just waiting for a train to go, or a bus to come, or the rain to go or the phone to ring… Everyone is just waiting”. Unfortunately, this picture reflects the malaise of South Africa today. There are real opportunities to improve education, to create jobs, to grow the economy; but they are not seized because everyone is just waiting – waiting for the elections, for policy certainty, for the economy to pick up. These factors may well be necessary to move South Africa to “the bright places where Boom Bands are playing,” but we can’t keep wallowing in the Waiting Place. Despite structural problems and resource constraints, there are obvious things to be done with the money and programmes we already have. Often, it’s just a matter of clear vision and connecting the dots. A good example is the Community Work Programme (CWP), which is intended as a social safety net and a bridge into employment for job seekers. A young person leaving school without the prospect of further study or work can receive a stipend of R92 per day, twice a week, provided they undertake supervised work in their communities. With over 200 000 participants, it provides an opportunity that should light the eyes of economists and educationists alike. Most of the participants are involved in community safety, environmental clean-up and road maintenance; but if just one-eighth of them were enlisted to support early learning, storytelling and reading, they would reach half of the one million 3-4-year-olds in South Africa who are currently excluded from any out-of-home early learning programme. There is strong evidence that such exposure would substantially improve their achievement at school. Since 2014, a partnership between the Department of Cooperative Governance (DCOG) and non-government organisations (NGOs) has trained CWP participants as Nal’ibali ‘Story Sparkers’, SmartStart playgroup facilitators, Zoe Reading Project champions, Axium ‘Nobalisas’ and COUNT maths mentors. These programmes involve close to a thousand CWP participants and reach about 15 000 children a year around the country. The initiative builds the skills of both CWP participants and the children – epitomising the actions proposed at the Presidential Jobs Summit to create jobs and build human capital through early childhood development at the same time. However, it has not been plain sailing. A third of trained participants have opted out of the early learning work. While we celebrate that some have found better-paying jobs – one of the aims of the programme – others have dropped out because educating children is more challenging than most other CWP opportunities. Many feel demotivated that they can’t see their way up into formal employment. Furthermore, the intensity of training and continuing in-service support has been constrained by the funding available for non-government partners. Possibly the biggest constraint has been the lack of a common vision of what could be achieved if all role-players came together and combined their efforts. In this instance, the CWP has the people; the NGOs have the programmes; the Sector Education & Training Authorities (SETAs) have the funding for training; and the Departments of Social Development and Basic Education have the policy and curricular frameworks to guide the design. We just have to connect the dots. This would require the relevant SETAs and the Ministry of Cooperative Governance and Traditional Affairs working together with civil society partners and other relevant departments to train and support 30 000 entry-level early learning facilitators over the next five years. To accomplish this, everyone must be willing to find each other and do things a bit differently. Government and NGO managers would need to present a united front in motivating and holding participants to account. The SETAs would have to accept funding of non-accredited programmes to get participants onto the first rung of skills progression, before significant additional investment is made in accredited training for selected individuals. All parties would have to accept that high rates of churn will persist as CWP participants, who may initially be willing to take up any work opportunity, ultimately decide whether early childhood development is really right for them. But these are minor issues, compared to the benefits that the nation would accrue if we made this vision happen now. As a country, we will never escape the doldrums if we make keep making progress contingent on future events. We must run ahead with lead programmes that show the way, especially those that relate to education and jobs – because ultimately these will generate the greatest wind in our nation’s sails. This article was republished by The Daily Maverick on 08 February 2019. David Harrison is the CEO of the DG Murray Trust and Shakira Maharaj is Innovation Director – All Young People Get their First Decent Job.